The ecoFLEX Habitat 'n Home InnPlace Pet Crate with Metal Spindles is the perfect crate for your pet while they are indoors. This stylish crate can pull double duty as an end table too. Made of durable non-toxic materials that is maintenance free as it will not crack, warp, absorb moisture and is easy to clean. Available in Russet, Espresso and Antique White. 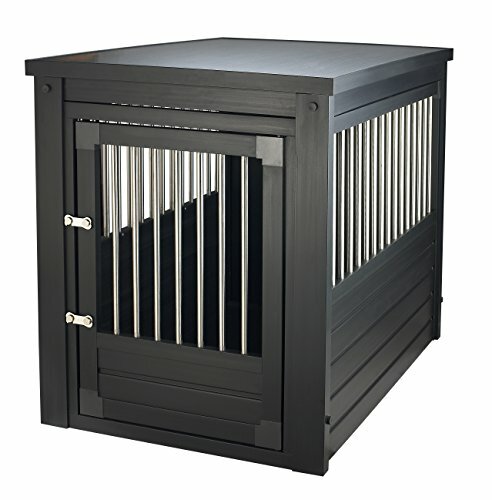 This easy to assemble crate is available in four sizes to accommodate all dog sizes. Double latches on large and XL models. 10 yr. Manufacturer's Warranty. Review dimensions prior to purchase.